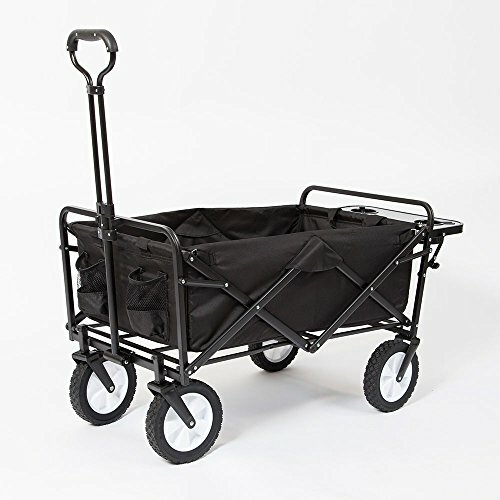 Mac Sports Folding Garden Utility Wagon w/Table, Black by MAC S P O R T S at Halo Grow Box. MPN: MAC-WTC-197-BLACK-TABLE. Hurry! Limited time offer. Offer valid only while supplies last. No more loading up your groceries like you're the Hulk when you have the Mac Sports Collapsible Garden Utility Wagon to give you an extra hand. No more loading up your groceries like you're the Hulk when you have the Mac Sports Collapsible Garden Utility Wagon to give you an extra hand. Featuring a strong steel frame, this utility cart can hold up to 150 pounds worth of goods. It is quick and easy to setup and when you're finished, it easily folds for convenient storage. Its durable fabric is UV and mildew resistant and cleans up easily. It also comes with a rear folding table with 2 cup holders. Ideal for sporting events, outdoor concerts, trips to the park, gardening, and loading or unloading the car, the Mac Sports Collapsible Garden Utility Wagon really has an infinite amount of uses.